ALILA’s third property in China will open this November in Wuzhen. Located just an hour’s drive from Hangzhou and 1.5 hours from Shanghai, AlilaWuzhen is a 5-minute drive from the famous Wuzhen Water Town. Inspired by Wuzhen’s maze of quiet canals and ancient alleyways, AlilaWuzhen is a modern interpretation of the water town’s design lineage with 125 generously appointed suites, villas and pool villas – all wrapped around private courtyards and intertwining waterways in a tranquil setting. 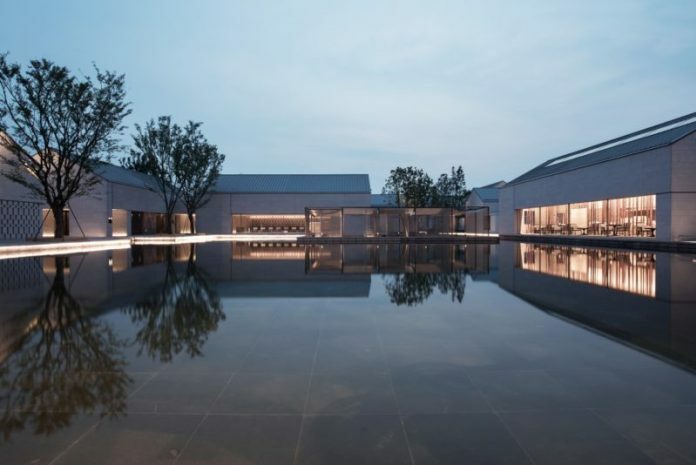 Designed by GOA, one of the prominent architectural firms in China, AlilaWuzhen’s “minimalist” aesthetics is an adaptation of the heritage buildings inherent, south of the Yangtze River. AlilaWuzhen’s architecture is a reimagination of traditional space reconstruction – of streets, lanes, courtyards and public areas – giving it new functionalities and purpose. “The Maze” at AlilaWuzhen comprises well-proportioned spaces full of twists and turns, reminiscent of classic villages, with its own modern waterways that correspond to the water town of Wuzhen, as well as the water system of Hangjia Lake Plain. A peaceful environment reigns in these private quarters and prevalent in every guest room, where design priority has been devoted to ensuring every modern comfort for its residents. The iconic indoor pool is inspired by the Arabian Alhambra’s starry bathroom where dappled sunlight etched delightful patterns onto its pitched roof. The main public spaces are gathered around a central water courtyard with water features dissecting indoor and outdoor spaces throughout the resort, while also maintaining the continuity of the buildings, just like the traditional villages of old. Four distinct restaurants and bars provide a delightful dining experience for the palate whatever the occasion, be it a romantic dinner or a family gathering. The variety of restaurants includes Shui Shi Kou, featuring a mix of Western and Asian cuisine; Si Shui& Private Dining Room featuring Cantonese and local Wuzhen cuisine. Guests can enjoy food with a local soul for true authenticity. The Sai Bai, a Day & Night Bar offers afternoon tea and an extensive choice of local “San Bai Wine” and Whisky. Other facilities at AlilaWuzhen include Spa Alila, a state-of-the-art gym with private yoga studio, as well as curated meeting and event space catering for up to 500 guests. BOOK NOW to enjoy the AlilaWuzhen ‘Watertown’ Package with opening rates from USD 289++ per night for a minimum booking of a 2-night stay in a Garden Suite. The rate is for two people sharing and available for booking until 31 March 2019.